Here I am going to tell you about Dark Sky Weather Forecast PHP Script which is developed by CodeSpeedy. In this article, I am going to tell you about the features and usage of this item. 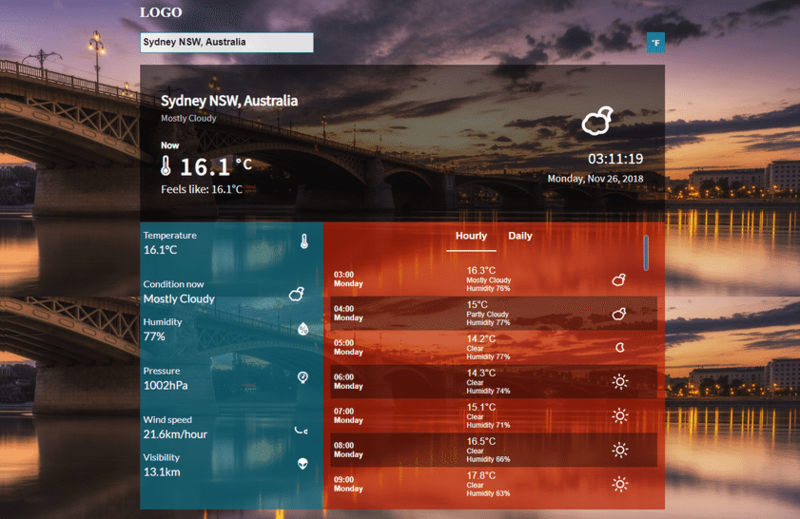 Before you continue reading this article, have a look at the live demo of this weather forecasting PHP script. You can download this PHP script from CodeCanyon. Now let me talk about the features and usage of this product. I hope you have already seen the demo. Clean and beautifully designed with attractive looks. You can also see the live demo to check how it looks. Users can change the unit. For example, from Degree Celcius to Fahrenheit and Fahrenheit to Degree Celcius. Easy to use and configure. You just have to configure from one configuration file to retrieve weather data. Documentation available with this script. You will able to change the background picture, logo and footer text. Completely works on AJAX. That means there are no reload of the page even after a user search weather for another location and change the unit. Usage of this script is very easy. You just need to provide your own API and place it in the directory. Though the usage is already in the documentation.html file of the script, I am still going to tell you the usage of this weather forecast PHP script. After you purchase and download this PHP script from CodeCanyon, unzip the dark_sky_weather_forecast.zip file from inside the purchased zip and place it in the root directory where you want to run the script. To use this PHP script, you need to get Dark Sky API from https://darksky.net/dev and IPInfoDB API from https://www.ipinfodb.com. Then put these API Keys in the inc/config.php file of the script that you have extracted from the dark_sky_weather_forecast.zip. From the inc/config.php file, you can do lots of more. In this file, you can change the background image, default unit (si or us), logo and you can set the footer text.